We have all seen globes. Some of us even have one. Africa is represented accurately on them. So is Antarctica. Practical considerations alone have dictated the proportion distortion effects of rectangular projection maps, not some kind of bias or blithe acceptance of an unfair representation of...what...size? If it is now necessary to inspect mapping practices for signs of bias, we have pretty much licked bias altogether. (Hooray!) On the other hand, perhaps the original article's motivations were more like the motivations it assigned to Google; don't be evil but do make money; so I shouldn't be too cynical, since I accept Google's success at it. 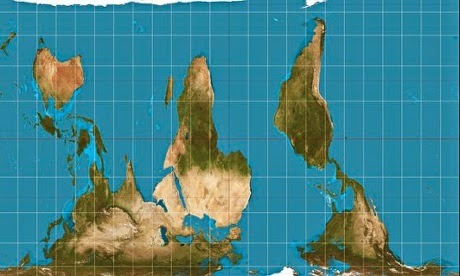 Perhaps we need a new social-conscience logo: "Fairly Proportioned Mapping". I had suspected that reverence of old things was for their age not their objective superiority at performing their intended purposes. I'll be buying only new violins from now on. Thanks for always keeping it fun, Matt!